This past week I finally caught up on my Goodreads challenge. I accomplished this mainly by reading through an entire box of beginning reader books to preview them for my three-and-a-half-year-old, who has suddenly started reading. But once I got through those, I spent the rest of the week catching up on my own reading. Here's what I read and what I'm reading next. This was a decent women's fiction novel, but heavier on the romance than I really wanted. Reviewed on Goodreads. I read this mystery only because it was set at Vassar. I have no interest in the rest of the trilogy. Reviewed on Goodreads. My husband brought this home, and it's popular in the Catholic homeschooling world, so I read through it. Not impressed. Reviewed on Goodreads. I'm reading the omnibus edition of this book, which also includes the sequel, Raising Demons. I have finished the first book, and just started the second. I'll review them both together when I finish. I read this book for the Old School Kidlit Reading Challenge and to start familiarizing myself with the resources we have collected for our homeschool. I have the review scheduled for the middle of next week. I had never read any of these, so I'm doing a review of the series (or as many of them as I can read) for Old School Kidlit. I'll probably wait to post it at the end of the month. I'm hoping to finish this and also read Robinson's later work, Writing for Young People, and then write up a review for Old School Kidlit. I had forgotten that I put this on hold but decided to give it a try when my turn came up. The reviews are very mixed, and though I have laughed a lot so far, I'm not quite sure what I think of it yet. I'm slowly making my way through this old favorite. Bradbury's writing is just so pretty. I haven't read much yet, but I just love Jackson's sense of humor. It seemed like it took forever for a local library to order this, and then I had to wait for my turn on the hold list. I'm sad to see this series end, but I am looking forward to one last summer in Pruet, Massachusetts. 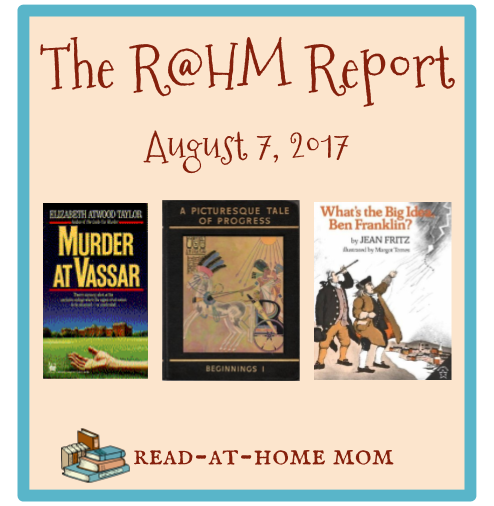 I'm linking up today with Book Date and Teach Mentor Texts / Unleashing Readers for It's Monday! What Are You Reading? Those Jean Fritz books are familiar. I haven't read them but know they were in my school media center. Come see my week here. Happy reading! I love Dandelion Wine. I have a copy in storage. Come see what I'm reading.